AAP MLAs Disqualification: In a major setback for the ruling Aam Admi Party government in the national capital, the Election Commission on Friday recommended President Ram Nath Kovind to disqualify 20 legislators of the party for holding profit of office. New Delhi: In a major setback for the ruling Aam Admi Party government in the national capital, the Election Commission on Friday recommended President Ram Nath Kovind to disqualify 20 legislators of the party for holding profit of office. If the president approves the EC's recommendations, bypolls will be held in the 20 assembly constituencies. 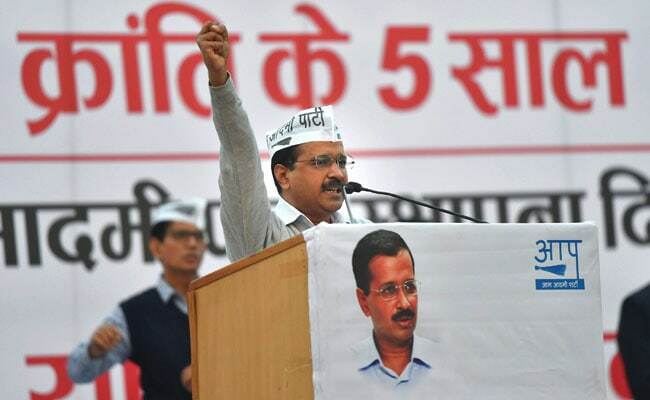 Arvind Kejriwal's AAP has 65 seats in 70-member Delhi assembly. The lawmakers were appointed as parliamentary secretaries soon after assembly elections in Delhi in 2015. Opposition had earlier called for action against the AAP lawmakers for holding office of profit. Here are the live updates on the disqualification of the AAP lawmakers. Breaking silence over Election Commission's recommendation to disqualify 20 AAP lawmakers, Delhi Chief Minister Arvind Kejriwal tweeted, "When you walk on the path of truth and honesty, you come across many hurdles. However, the universe conspires to help you. God helps you. Because you are not working for yourself but for the society and nation. History is witness that truth wins in the end." Former AAP leader Yogendra Yadav's Swaraj India on Friday supported the Election Commission move recommending disqualification of 20 Aam Aadmi Party legislators for holding office of profit, news agency IANS reported. The appointment of legislators as parliamentary secretaries was not just a technical violation of constitutional norms but also a serious case of political immorality, the party said. Following the Election Commission's recommendation for disqualification of 20 AAP lawmakers this morning, Delhi High Court today heard the pleas by seven lawmakers mentioned before the high court bench for urgent hearing, listed for today itself. The petition before the Election Commission was earlier filed by one Prashant Patel against 21 lawmakers, who were appointed as parliamentary secretaries by the AAP government in Delhi. Subsequently, the proceedings were dropped against Jarnail Singh after he resigned as the Rajouri Garden MLA to contest the Punjab Assembly polls. Even if the AAP lawmakers are disqualified in case of President's approval, the disqualification will not endanger the Arvind Kejriwal government though its numbers will come down to 45, news agency PTI reported. They would still enjoy a comfortable majority. Delhi High Court will hold the next hearing in office of profit case on Monday, news agency ANI reported. West Bengal Chief Minister Mamta Banerjee tweeted this evening, expressing support for Arvind Kejriwal. "A constitutional body cannot be used for political vendetta. The 20 AAP MLAs were not even given a hearing by the Hon EC. Most unfortunate. This goes against the principles of natural justice.At this hour we are strongly with @ArvindKejriwal and his team," she posted. BJP's city unit chief Manoj Tiwari said the EC allowed long adjournments to the 20 MLAs during the hearings of the issue which cost dearly to the people of Delhi. "We welcome the EC decision disqualifying 20 AAP MLAs. Arvind Kejriwal should take responsibility for moral defeat and resign," he said. Taking advantage of EC's long adjournments of hearings on the issue, these MLAs have not only "looted and cheated" the people of Delhi but also denied development, Mr Tiwari was quoted as saying by news agency PTI. "Taking advantage of this delay the AAP has succeeded in sending three persons to the Rajya Sabha and in the process has also sullied the image of the Upper House of Parliament," he said. In its opinion sent to President Ram Nath Kovind this morning, the Election Commission said the AAP lawmakers under scanner, by occupying the post of parliamentary secretaries between March 13, 2015 and September 8, 2016, held office of profit, and were liable to be disqualified as legislators, PTI news agency reported citing highly-placed sources. AAP lawmaker Saurabh Bharadwaj, speaking to NDTV about the Delhi high court hearing in the office of profit case, said, "The current hearing was regarding the case of parliamentary secretary is maintainable or not. In light of the high court judgement, (which) ruled that this notification of parliamentary secretary was illegal and it is null and void. This parliamentary secretary office never existed. Petition said that because they were parliamentary secretaries that's why the parliamentary secretary is an office of profit. This kind of strategy has been tried by a lot central governments against their political adversaries in different states. In most cases, the high court have stayed such illegal orders and we are hopeful we will get a stay on this, if this is an order. We can get a lot help from the high court." "Mr Jyoti, who is the current Chief Election Commissioner of India, is a 1975 Gujarat cadre officer. He has served with Mr Modi as his principal secretary. He has served Mr Modi as his chief secretary. He is supposed to retire (in a few days). He was brought in the election commission when Mr Modi knew he has just seven months in office. He was brought into the office just with motive to help BJP in Gujarat election and then disturb the AAP government in Delhi." Alka Lamba, one of the 20 legislators who are under the scanner, said, "Did not take a single penny. Did not enjoy any privileges. File RTI and see what have we ever got from the government. The irony is Haryana allowed to have parliamentary secretaries but Delhi isn't allowed." After the ruling Aam Admi Party approached the Delhi High Court in office of profit case, the high court is hearing the AAP MLA disqualification case right now. Some of the lawmakers, who can be disqualified according to EC recommendations, are also at the high court. Former AAP Minister Kapil Mishra also attacked the party in several tweets and claimed the national capital will soon have a new government following re-elections. Let me put in on record - There will be a "New Govt" in Delhi after result of 20 MLAs Re-Election. In the AAP MLAs holding office of profit case, the petition was made to disqualify 21 MLAs, but one of the legislators had resigned a few months back, news agency PTI reported. Amid accusations of his lawmakers holding office of profit, Arvind Kejriwal and his party had stressed that none of the AAP legislators drew salaries as parliament secretaries. But the rival parties argued that the posts allowed them perks. But AAP leader Ashutosh alleged EC was working under the influence of PMO. He also talked about covering the Election Commission as a journalist. EC SHOULD NOT BE THE LETTER BOX OF THE PMO.. but that is a reality today. Former AAP leader Shazia Ilmi, who is now a member of BJP, also suggested Mr Kejriwal should resign. "What was the need to make them parliamentary secretaries? Arvind Kejriwal had already started creating an environment to suggest EC is acting as BJP's agent. He must resign. They must accept EC'S decision." In a tweet sent to Delhi BJP Chief Manoj Tiwari, she attacked AAP and its chief Arvind Kejriwal. Delhi Congress President Ajay Maken in a tweet insisted Chief Minister Arvind Kejriwal should resign. Reacting to the reports of AAP lawmakers' disqualification, the Election Commission, according to news agency ANI, said, "Recommendation on AAP MLAs being disqualified is subjudice. Will not comment on what recommendation has been given to the President." Later, a petition was filed in the Delhi high court sought the AAP lawmakers' disqualification saying the Constitution does not allow elected representatives to hold offices of profit. The Election Commission was asked to give its opinion. After claiming a thumping majority in the 2015 Delhi assembly election, AAP Chief Arvind Kejriwal had appointed 21 legislators as parliament secretaries.